More than a hundred years ago, physicists understood that heat is simply the energy stored in the vibrations of atoms, and therefore realized that heat and sound are related. Now my lab showed experimentally for the first time that these atomic vibrations have magnetic properties too. Today, physicists treat phonons as quasi-particles, having both wave and particle properties. Phonons carry both sound and heat. In metals, heat is carried primarily by the movement of electrons in the atoms. However, in all other materials, heat is carried almost exclusively by the phonons. So the mechanical, acoustic and thermal properties of sound waves have long been established. Yet, before now, nobody ever imagined that sound waves might also have magnetic properties. A lopsided tuning fork, made of the semiconductor indium antimonide, used in the experiment. In the March 23 issue of Nature Materials, we offer experimental proof that sound waves do interact with external magnetic fields. 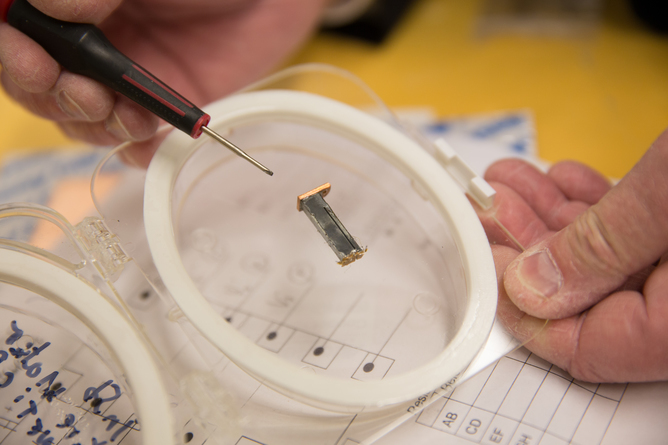 The experiment was carried out on a large, single crystal of a very pure semiconductor, indium antimonide, which had been cut into two unequal sections and then cooled to about -445F (-265C). A controlled amount of heat was made to flow in each section separately. At these temperatures, the phonons can be thought of as individual particles, like runners on a racetrack each carrying a little bucket of heat. Artist’s rendering of a phonon heating solid material. 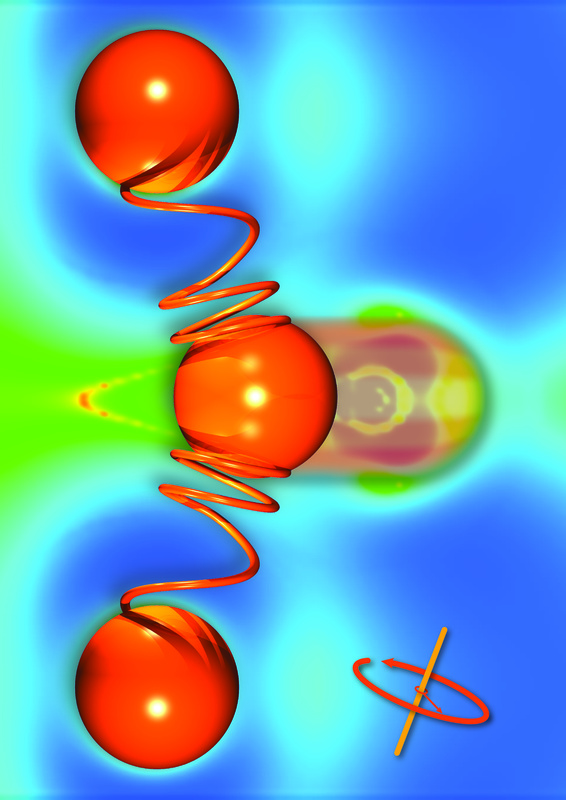 The phonon hits the center orange atom, which is attached to other atoms via spring-like bonds. The trail of the passing phonon is marked with increased magnetic field intensity, shown in green. In the small section, the phonons often run into the walls, which slows them down. The small section is used as a reference, to make the experiment independent of the other properties of the solid that might interfere. In the large section, the phonons can go faster, and they don’t run into the walls as much as into each other. When we apply a magnetic field, they tend to run into each other more frequently. Because the magnetic field increases the number of collisions, it also slows the phonons down and lowers the amount of heat they carry by 12%. We think this is due to the electrons that rotate in orbits around each atom in the solid. The orbital motion of these electrons emits a very small intrinsic magnetic field that interacts with the externally applied field – an effect called “diamagnetism.“ This property exists even in substances we don’t traditionally think of as magnetic, such as glass, stone or plastic. When the atoms vibrate due to the passing of the phonons, this interaction creates a force on the atoms that makes the phonons collide with each other more often. What can we do with these results? At this point, we’ve just described a new concept, something that had never been thought of before. Engineers can perhaps use this concept to control heat and sound waves magnetically. Sound waves can be effectively steered already by using multiple sources of sound, as is done in ultrasound imaging systems, but controlling heat conduction is much harder. Conversion of heat into electrical or mechanical power, as is done in engines and in power stations, supplies over 90% of the energy humanity uses. Therefore, being able to control heat conduction at will could have an enormous impact on energy production, though, obviously, applications of this emergent concept are still quite a way in the future.